Mop, spray, scrub or pressure wash as necessary. Dilutions: 1 part to 10 parts hot water for heavy duty degreasing. 1 part to 30 parts hot or cold water for pressure washing, and for cleaning and sanitising heavily soiled surfaces. 1 part to 50 parts water for cleaning and sanitising lightly soiled surfaces. 1 part to 300 parts water for regular damp mopping of lightly soiled areas and as a sanitising rinse. N.B. 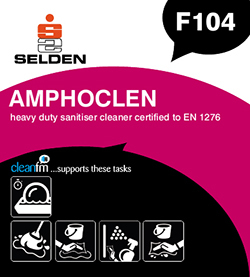 Do not allow Amphoclen to dry out on aluminium or light metals e.g. zinc or tin. For latest test results consult website.